The M&A business accompanies the sale processes of enterprises and investigates legal implications due to the sale of shares or assets. Each regional M&A market is following its own rules, e.g. the economic and legal environment varies country by country. Foreign investors have to adopt this parameters in order to minimize financial and legal risks, that could arise through the acquisition process or after sale restructurings. The handbook Mergers & Acquisitions in Germany is classified into 15 chapters, each with its own topic. After a brief introduction to the German M&A market, the focus is on the sale process itself and its legal implications. The different phases of the auction are described. The preparatory steps for reorganizations, carve-outs, spin-offs and the purchase agreement itself are specified in detail. Other topics as financial securities given by the target, for exemple guarantees given for the financial standing of an affiliate (Patronatserklärung) or equity effects settled through recent German legal changes are explained as well. Particularities that may arise through a public takeover, a squeeze-out or the delisting of targets are considered too. The following chapters are dedicated to the transparency and reporting obligations vis-à-vis investors, the post closing measures to integrate the target and other legal aspects as labor or competition law. 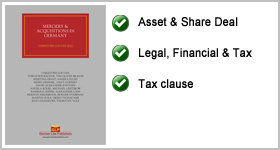 The handbook includes tax aspects relevant for share and asset deals, the complexity of tax units (Organschaften) and the tax clause, that must be taken into consideration for any share deal. Most of the authors are working as counsels in the legal, financial or fiscal area. This huge practical experience brings significant benefit to all foreign investors. The diversified subject of this handbook gives a very good overview about the German M&A environment. Last but not least additional legal sources are provided for more detailed information.